Experienced defender Bates will now attempt to preserve the club's League status and he will be assisted by captain Billy Paynter, Stuart Parnaby and Ian Gallagher. 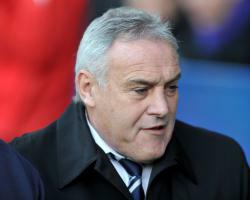 A club statement read: "Hartlepool United can confirm that Dave Jones has left his position as first team manager by mutual consent. "Assistant managers Alex Armstrong and Kevin Cooper have also departed The Northern Gas and Power Stadium with immediate effect. "The club would like to place on record its thanks to Jones, Armstrong and Cooper for their efforts and wish them every success in the future." You've got 13 points from 51, this is not your level of football. "(Finance director) Pam Duxbury, the chairman Gary Coxall, if he won't walk, then sack him. "If it means me resigning as president then I do so happily - do it now, do it today." Why should he say that? "Does he say it about anyone else? (Arsene) Wenger? It's not his job, his job is to report. "He hasn't phoned me - a few weeks ago he's sat in my office crowing about us going five games without losing, how we've changed it around. "What's changed? I haven't changed or has he forgotten that? "I'm fighting for my life, how about a bit of support Jeff, rather than the rubbish you are giving out?" They finish the campaign at home to champions-elect Doncaster on May 6.